Paulus Book Now on sale, $20.00. 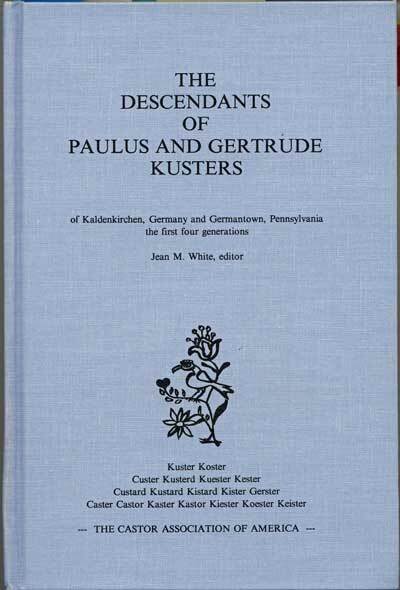 The Descendants of Paulus and Gertrude Kusters of Kaldenkirchen, Germany and Germantown, Pennsylvania the first generations. Published by the Castor Association of America. Copyright 1991 303 pages; indexed. Click on the Order Book link below. If your using the Chrome or Safari browser's, you can fill out the form and print it. Using other browsers, download, print and fill out. You can order the book by using the online order form. Click on the link below. Benedict Custer born in Switzerland in 1640 and his Descendants. Three of his ggg-grandsons, Stephen, Ursus and Johannes came to America in 1845. 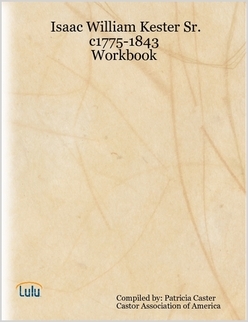 Isaac Kester 1775 - 1843 of Arkansas Workbook. Published by the Castor Association of America. Copyright 2007: 90 pages: indexed. 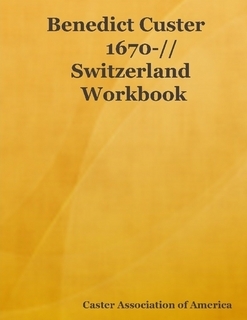 To purchase as a PDF. CAOA Archive Coordinator,compiled by Patricia Caster. Published by the Castor Association of America. Copyright 2014: 42 pages: indexed.